More than 100 large wildfires are currently burning across the American West. And while 2018 is shaping up as one the more destructive fire seasons on record, the impacts of more frequent and larger fires have become all too familiar over much of this hot, dry decade. 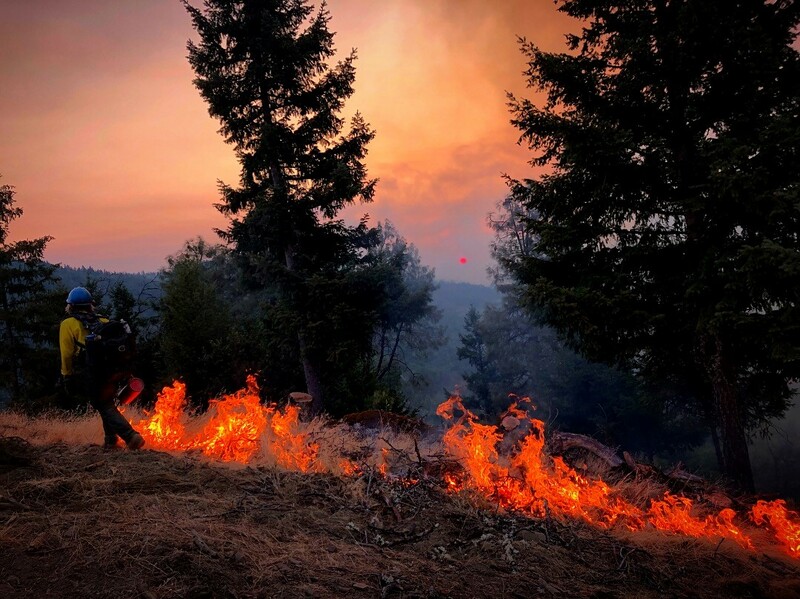 Despite the yeoman’s efforts of firefighters and the expenditure of more than 2 billion dollars, more than 7 million acres of forest go up in flames each year and a dozen or more people lose their lives. These fires recognize no property lines, and because of the West’s unique land ownership patterns, large blazes typically impact private-, federal-, and state-owned lands at the same time. 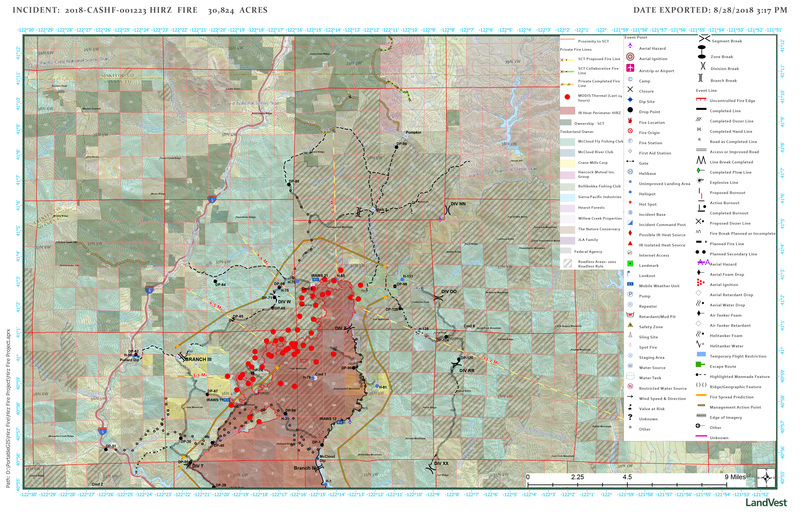 Tactical briefing map on the Hirz Fire showing thermal hotspots and fire line construction. When seen from the air or on a topographical map, much of the West resembles a checkerboard. This curious arrangement began when railroads opened the region to settlers. Congress divided ownership of adjacent lands into one square-mile units and gave every other section to the railroads, retaining the others for federal use. Much of that railroad land has subsequently ended up in the hands of private timber companies, and today their plantations alternate block by block with public land, often managed as wilderness areas. Fortunately for timberland managers and owners, the fight against destructive fires in the region is a cooperative effort that also crosses boundaries and unites stakeholders behind common goals of putting out fires and saving forests. 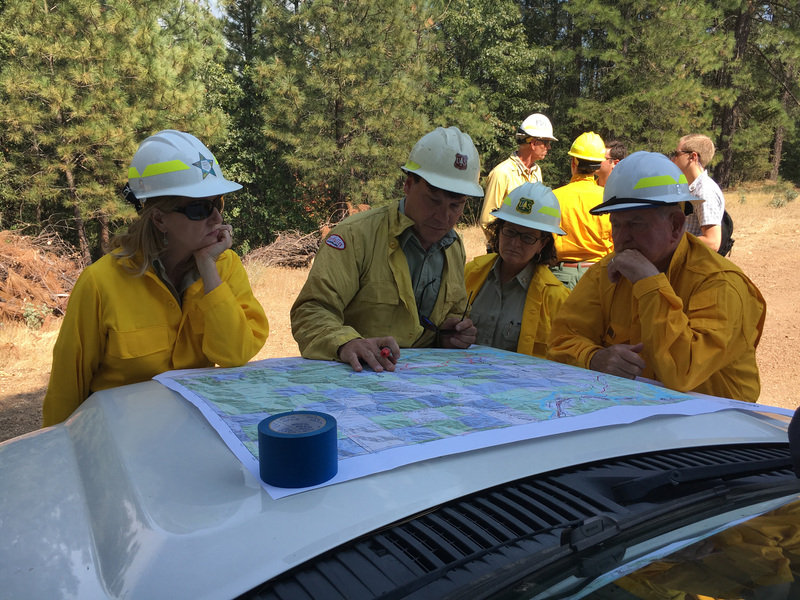 The Hirz Fire, which has burned more than 46,150 acres in and around California’s Shasta-Trinity National Forest, exemplifies this cooperation since crews started battling it on August 12. 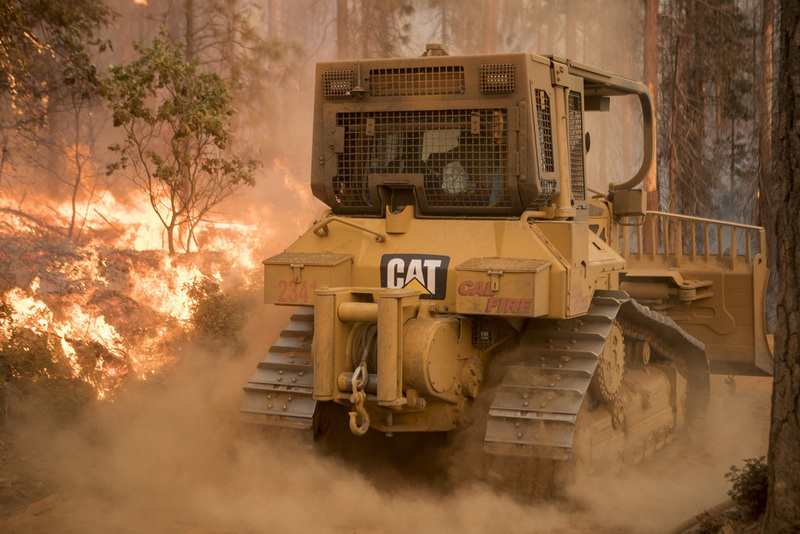 Daily meetings gather timber industry and agency experts to chart the fire’s progress, review deployment of firefighters and machinery, and map the construction of fire lines, critical stretches of forest stripped of all burnable fuel to halt a fire’s spread in a specific direction. Construction crews race to construct a ridge-top fire line fuel break in advance of the oncoming Hirz Fire. 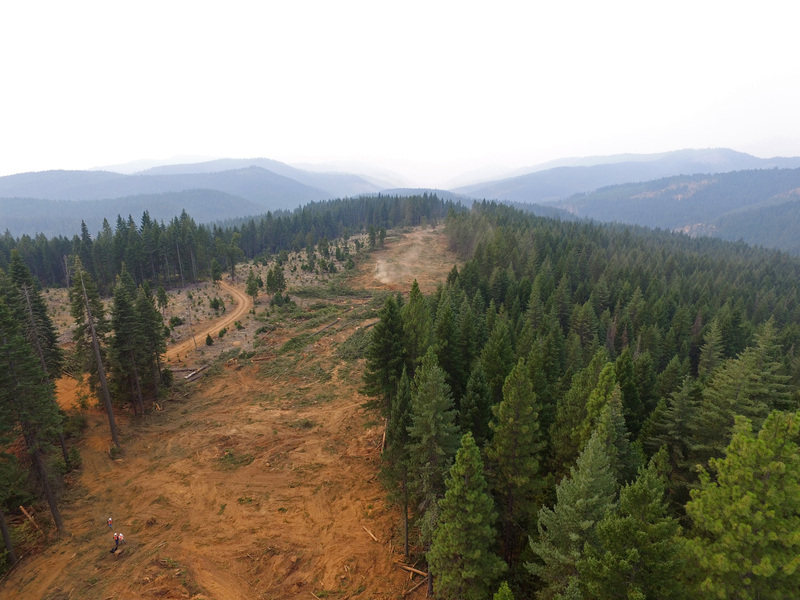 The alternating square-mile lots now in the hands of timber companies and government agencies can be very different environments even when clustered side by side. Federal land management goals typically focus on a longer rotation and more natural forest management—a more hands-off approach that directly impacts fire behavior. CAL FIRE crews man fire lines for a full 24 hours, he notes, and make heavy use of aerial efforts to hit fires with water and retardant. Such efforts help support a chief goal of timber managers—the protection of premerchantable plantations. These stands of young trees have been managed for a decade or two but haven’t grown large enough to avoid incineration in a big, hot fire. Timing also plays a role in marketing such timber. After particularly bad fire seasons, mills may be inundated with such wood and can depress values. Changing climate, with its heat, drought, and winds, may make future forests still more susceptible to catastrophic fire. But the human factor also enters the equation. More people are living, vacationing, and driving through the West’s forests—and they are also starting fires. Though most fire starts are accidental, humans are responsible for a huge percentage of them – more than 80 percent according to recent research. “The Carr and the Hirz Fires were both started by vehicles,” Paul Bertagna says. “There are a lot more cars these days, a lot more trailers, and a lot more people, so the fire starts are going up.” Drawing on decades of firefighting experience, Bertagna stresses a need for public outreach and education on all manner of risky fire behaviors, from safe debris burning to handling flat trailer tires. 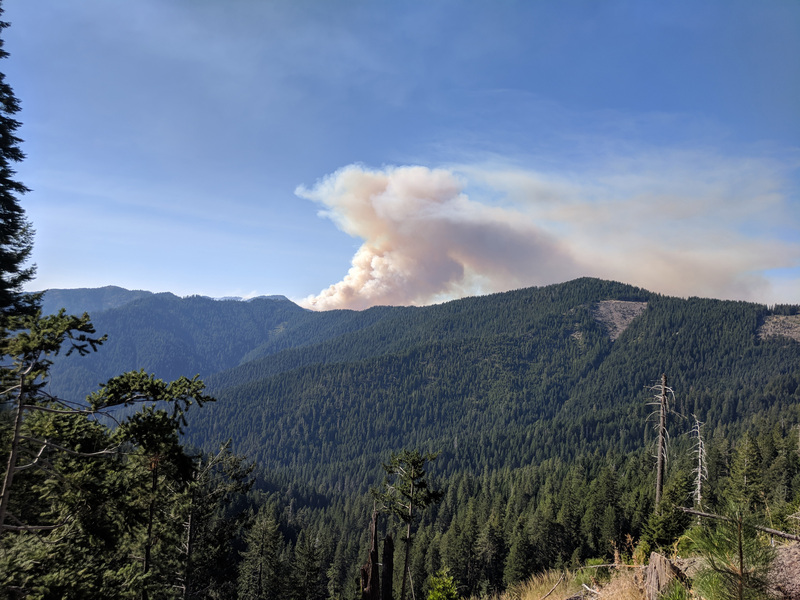 Update: The Hirz Fire was nearly 100% contained on September 6 when a new fire erupted along Interstate 5 near the community of Lakeville, just west of the Hirz Fire. The new incident, known as the Delta Fire, eventually joined up with the Hirz Fire on its east flank. 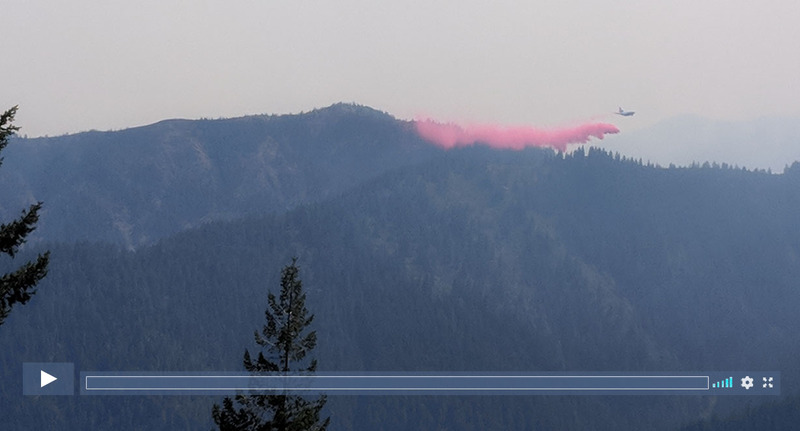 The Delta Fire, which has burned 57,000 acres, is being battled with over 1,600 personnel in unified command by CAL FIRE and the US Forest Service. While still under investigation, the Delta Fire has been deemed as human-caused. LandVest is the US leader in timberland management, real estate consulting, and real estate transaction services. Founded in 1968, LandVest manages over 2.2 million acres of timberland on behalf of institutional, family, and NGO owners. LandVest’s technical, consulting, and transaction service groups provide appraisal, due diligence, and marketing services on over $2 billion in real estate assets annually.